At Wellington we strongly believe that geography is an integral part of curriculum and teachers ensure they plan and teach exciting and engaging lessons. Through geography we aspire to enhance a child’s learning of the world, deepen their understanding of their place in the world and the impact they have on its future. Through enquiry led projects we wish to maximise every child’s potential. We aim to provide opportunities to enable children to develop skills to investigate, make sense of and communicate with the world around them in order to become responsible, healthy members of the community. Our teaching will be based on the Programmes of Study for Key Stage 1 and 2 (National Curriculum 2014). It will also be linked to the year group’s current creative curriculum topic. Help pupils develop knowledge and understanding of places and themes including patterns and processes. Enable pupils to develop a sense of identity through learning about the UK and its relationships with other countries. Help children understand how to use a map in a variety of different contexts. Article 29 – your education should help you develop your talents and abilities. It should also help you learn to live peacefully, protect the environment and respect other people. Article 2 – all children have these rights no matter who they are and where they live. The Local Area (Fieldwork) - What is in your local area? Weather – What different types of weather are there? The Arctic Vs UK – How is the Arctic different to where I live? London Vs Sydney - Where would you like to live? Our school and Local area (Fieldwork) - What are the physical and human features in our local area? Hot and Cold Places - Where are the hottest places in the world? How does this affect the people that live there? Our school (Fieldwork) - What do I know about my school’s grounds? Eurozone - How do the geographical features differ within Europe? Volcanoes - What are volcanoes and how do they affect the people that live near them? - What are the similarities and differences between biomes? Our Local area (Fieldwork) - How has land use changed over time in my local area? Africa - How are areas of Africa/ the UK different? Fairtrade – is it fair? Rivers and Coasts (Fieldwork)– How does water affect the environment around us? Amazing Americans - How do natural disasters affect us? My Local Area (Fieldwork) - How has my area changed over time? How can it be improved? 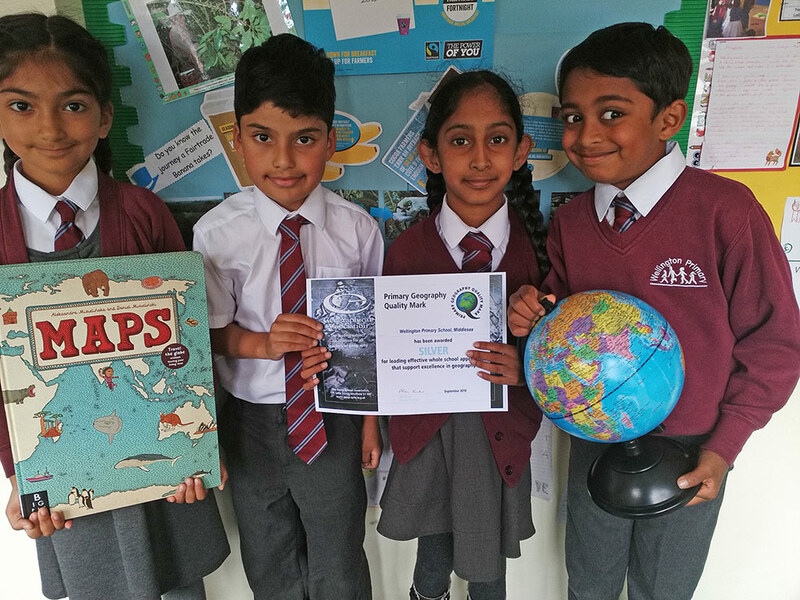 In 2016 Wellington achieved the Primary Geography Quality Mark Silver award. It was noted that Wellington teachers ensure policies impact on pupil learning and are not afraid to take risks, and innovate and challenge to achieve progress in geography. Key threads through the curriculum are inter-cultural understanding, local fieldwork, environmental issues and dilemmas connected with sustainability. These are explored in a variety of places across the world from local to global. Wellington uses creative approaches to stimulate learning and place a high value on using real life issues to promote understanding.